So today I am a bit distracted. My mom is having surgery to remove a cataract, and I admit I a bit worried. It’s only natural, they are poking around with her eye and she has a history of not doing so well with any type of anesthesia. Of course prior to getting her surgery scheduled, she agreed to host the extended family tomorrow for July 4. So being the good daughter that I am, we are sticking around a few more days in San Diego to help with the party etcetera. The girls and I went to the grocery store so get supplies for tomorrow and to make swiss steak (a favorite of mom’s) for dinner. The girls were “driving” the blue police car cart, the Big One loves blue remember. As we are checking out, the Big One asks if she can put the rice cakes that she covets up on the belt to pay for them. I say sure, so I unbuckle her and realize the Little One has picked something up along the journey. I honestly couldn’t tell what it was. And today was one of those days where the checker is scanning faster than I am putting things on the belt, someone is waiting in line behind us and the Big One is having a really hard time putting her bag of rice cakes up on the belt. She is not quite tall enough for the ones at this particular Vons. So in my haste I just grabbed whatever was in the Little One’s hand and threw it up on the belt. Once we got home and I was unpacking the bags I discovered the random item… a corn brush. 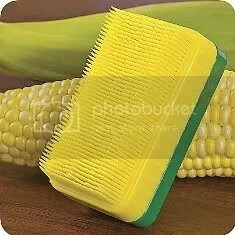 Seriously does anyone use a corn brush? I guess it’s supposed to help remove the silks from the corn. Thankfully it only cost $2.49, but still what am I going to do with it? I think we should be getting some fresh corn from our co-op box over the next few weeks so I may give it a try. I am shocked that it took this long for the random item to appear in my cart. So tell me what have your kids snuck past you at the store? Or let me know if you’ve got a corn brush, and if it works. ← What Size Is That? Oh the joys of shopping with children! Once we came home and unpacked our bags to find this….THING?? Have no idea, it was some sort of fruit or vegetable I’ve never seen before. 🙂 It didn’t look tasty so I have no idea what the kid was thinking! Sorry, never used a corn brush. LoL The name makes me giggle. The only thing ever snuck into my basket my the kids is candy. But….when Hubbs goes shopping with me, its usually ME sneaking stuff in. Like magazines and icecream sandwiches. I accidentally stole socks from target when K was about a month old – the old “lost it in the bottom of the enormous stroller while shopping w/an infant” trick. I had read that this would happen eventually, but I was a little horrified when it did…but i never went back and paid for them either….there – now i feel better. i confessed! The most recent add-on for us was weight watchers caramel snack cakes. They were delicious. That sounds like a yummy addition!